zucchini carapaccio, originally uploaded by shaunaforce. Right now, in Seattle, the rain is pounding down outside. The amber-golden street lights are glimmering in the puddles, shimmering and shifting shape. And some of the trees, through the raindrops, are merely bare branches now. Gone are the days when I remarked, Its starting to be autumn. Were well in it now, even tilting toward winter. Every year, Im amazed at how quickly time slips away. Every year older, it goes faster and faster. When the air is chilly and the trees feel withered, I start to long for time sitting by the fire. (Except I dont have a fireplace.) I dream of pureed sweet potatoes, slow-simmered stews, and crisp apples in nearly everything I eat. And this week, Ive had all three, in ample portions. (Youll probably hear more about them later.) Im planning more soups, in the crock-pot, the autumnal aroma filling the kitchen for hours. And this morning, I actually began thinking about Thanksgiving. So thats one way to deal with the earth turning toward dormancy: fall into it. But the other is to rebel. And make something with zucchini. I love zucchini. In the summer, I dine on it nearly every day. Next summer, I can tell, Im just going to have to give in to my domesticity and plant a little garden in the patch of earth in front of my house. Ive gone from eating mostly in restaurants or out of packages to making everything from scratch with ingredients Ive bought at the farmers market. Becoming a gardener is the next step, Im sure. And Ill do it just for the zucchinis. Tossed into summer soups, or sauteed with gorgeous olive oil and sea salt, zucchini just makes me happy. However, I rarely eat it raw. When it cooks, it softens and becomes translucent. Raw, its crisp in a way that unnerves me. So Im always throwing it into the sauce pan. When I saw a recipe for raw zucchini carapaccio, therefore, I was dubious. What made me even more dubious was a quick glance at the cover of the cookbook. Eat This Book, by Tyler Florence, seemed like yet another vanity project for the Food Network. I have to say, at the risk of alienating them and negating any chance I have of ever being the host of my own show, Im really not that fond of the Food Network. Maybe Im just stopping by at the wrong time of day, but it seems far too invested in the surface of things. I mean, a cooking show with an applauding audience? Bah. Cooking is intimate, sometimes grubby, full of imperfections, and mostly about the close-up detail. Or maybe I just like someone fierce and quirky, like Julia Child, teaching me how to cook on tv. She would never have found a job in Hollywood. But my god, that woman was herself. Well, I had to make a recipe after reading that. It made me miss the indolence of summer. And in that mood, I decided to try his recipe for zucchini carpaccio. Oh yum. 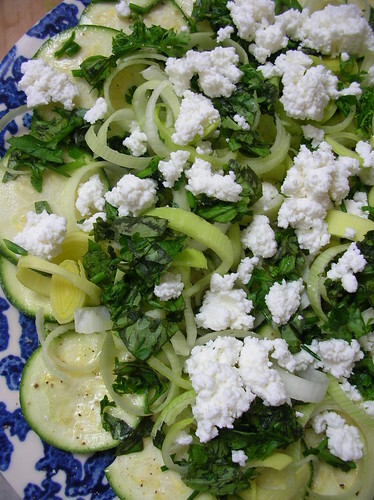 The salt, olive oil, leeks, and fresh herbs cook the zucchini in the refrigerator, and it all melts together in a gorgeous combination, made softer in the mouth with fresh ricotta. I have to say, in all honesty, in the last three months, I have made a new dish (or two or three) every night for dinner. Im not kidding. Ive been so enjoying the exploration, the tastes of the season, the discovery of the glories of foods I had never eaten before that I just havent wanted to repeat anything. Except for three dishes. The plum crumble I made in September (and even with Dapple Dandy pluots instead of Italian plums, its still just heaven). A special ceviche (I cant really tell you about that one; Im sworn to secrecy). And this zucchini carpaccio. I made it first with Meri, just before she left for Asia. I made it with Molly last weekend. And I made it again this week, on an evening alone. Each time, I revelled in it. And the day after, I swooned over the leftovers at work, in my office. So it seems, once again, that appearances can be deceiving. I have to remember this: just because someone is good-looking doesnt mean he cant cook. I ate my humble pie in the form of raw zucchini, melted with lime juice and thyme. You should make it too. Shingle the zucchini slices in a single overlapping layer on a platter. Dust with salt and pepper, then drizzle with a three-count of olive oil and the lemon juice. Sprinkle with the herbs. Now scatter the leek over. Put that in the fridge for about ten minutes to give the flavors a chance to get into the zucchini. Then garnish with the ricotta cheese and mint leaves. [Shaunas note: I recommend leaving it in the refrigerator for longer than ten minutes. Sure, it might look a little more wilted if you leave it in for an hour, but the taste will more than compensate for the look. If there should be any left over, then youre not going to believe how much deeper the carpaccio will taste the next day. Shauna, I too love zucchini, and will definitely make this recipe. Thank you for sharing it. 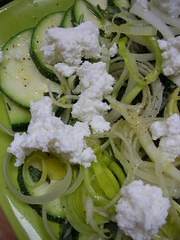 I have found that sliced into julienne the long way, zucchini also makes a good substitute for spaghetti. (I need to eat not only gluten free, but low carb, so rice noodles and gf pasta are off limits for me.) But the julienned zucchini, tossed for 3-5 minutes on high heat in a big saute pan with some olive oil, onions, and italian herbs until the julienne starts to become tender, then tossed with tomato sauce and served with italian sausages, makes a great dinner in which I hardly miss the pasta. Oh, and uncooked, peeled julienned cucumber subs for soba nicely when making chinese-style cold sesame noodles. Yum. Such a great Photo Shauna. Beautiful job as always! My goodness, you have more of a struggle than me. But how ingenious to use zucchini as spaghetti noodles! Thanks. I love what you’re doing over there at your blog. Thank you so much. You are so prolific these days!